Mika Vainio : Processing, electronics. Recorded in Vooruit, Ghent. 20-22 december 2011. Editing and mixing: Dousselaere, Vainio, Deforce. -Brussels, October 2013. Mastering: Denis Blackham @ Skye mastering. 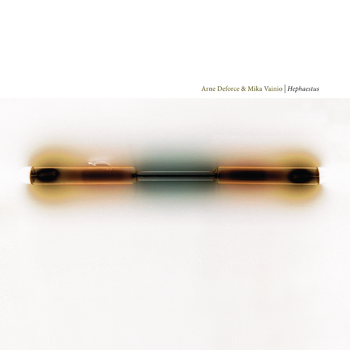 Arne Deforce is renowned for his passionate and unparalleled performances of contemporary and experimental music. As a soloist, his repertoire consists mainly of solo and chamber music with a special interest in works deemed ‘unplayable’ but ‘performable’ from composers such as Iannis Xenakis, Richard Barrett, John Cage and Brian Ferneyhough. Mika Vainio was one half of the minimal electronic duo Pan Sonic. His solo works, under his own name and under aliases like Ø, are known for their analogue warmth and electronic harshness ranging from abstract drone works or minimal avant techno. In Greek and Roman Mythology, Hephaestus was the god of fire; celestial blacksmith; craftsmen, artisans, sculptors, metals, metallurgy, fire and volcanoes; son of Zeus and Hera; husband of Aphrodite. The river Phlegethon was one of the five rivers in the infernal regions of the underworld, where Hephaestus operated. Plato describes it as "a stream of fire, which coils round the earth and flows into the depths of Tartarus. It is said that the goddess Styx was in love with Phlegethon, but she was consumed by his flames and sent to Hades. On this Editions Mego release, Hephaestus couples the rich acoustics of Deforce's cello techniques with the raw expressiveness of Vanio's electronics. The music reflects these ancient symbols whereby each track possesses physical, emotional and psychological states. The journey begins with 'Phlegethon (stream of fire)' - a world of sound building in intensity and ferocity as a means of navigating the listener into this other world. Both Cocytus (river of lamentation) and Acheron (river of woe) explore more introspective (ambient) terrain, harnessing the players ability to conjure discrete congruous textures. From here we are hurtled into the unbridled fury of 'Styx (river of rage)' where the consummation of the individual and eternal agony resides amongst the synergetic logic adopted by the artists and their chosen tools. 'Lethe (river of forgetfulness) or oblivion' incorporates small repeating phrases and minimalist motifs which provide a sense of disorientation and dislocation for the traveller/listener whilst a world of respite is laid bare in the comforting yet brooding closing piece 'Elysium (fields of relief)'. Hephaestus is a fascinating journey through the netherworld of human extremity presented as a combination of pure acoustic and electronic sources and realised in both physical and psychological manifestations.